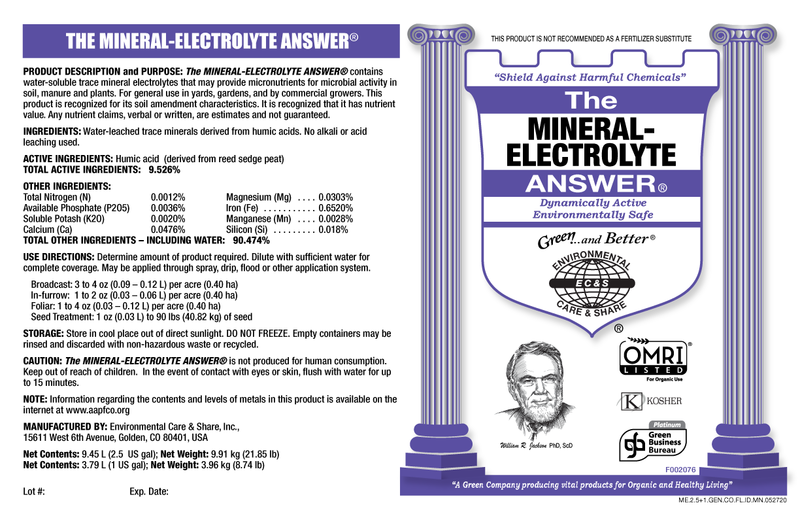 What is THE MINERAL-ELECTROLYTE ANSWER® & what is its purpose? THE MINERAL–ELECTROLYTE ANSWER® helps regulate, restore and balance the ‘Electrical Life’ of each cell, as it acts as a conductor to provide the essential energy required to survive, thrive and function. It’s a liquid source of low-molecular-weight, bioactive electrolytes that are water-soluble and derived from all-natural fulvic acids that stimulate the plant’s metabolism, growth and development. THE MINERAL-ELECTROLYTE ANSWER® provides plants and microbial life with trace minerals and a natural magnetic charge (conductivity), affecting the health and growth of cell life by stimulating various physiological and biochemical processes related to cell metabolism. THE MINERAL–ELECTROLYTE ANSWER® is extremely versatile and can withstand extreme pH conditions and soil types, acts as a ‘donor or acceptor’ in water, soil, and plants, based on the cell’s requirement for balance. Not only does it provide nutrients and minerals essential for the plant, but it will scavenge, chelate, and bind up heavy metals and toxic chemical substances. It can keep these harmful substances in check until the microorganisms are able to consume and digest them effectively — resulting in nutritional plant food, extended root development, better water penetration and improved aeration. 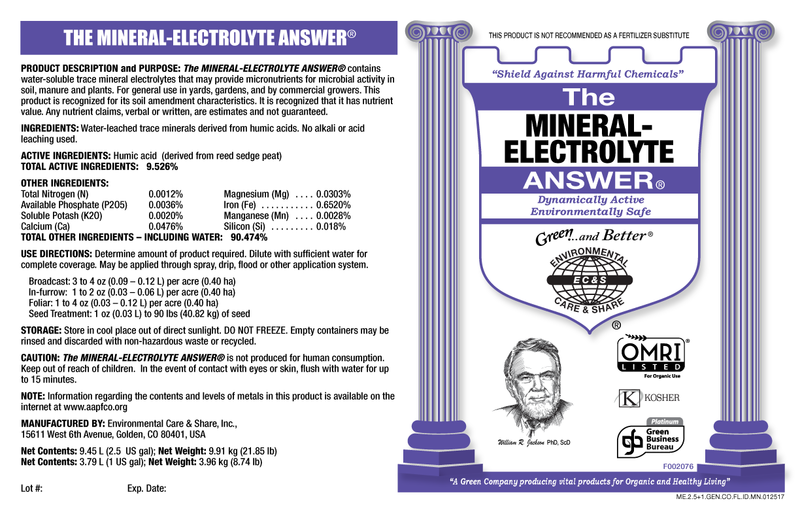 What is THE MINERAL-ELECTROLYTE ANSWER® & what's its impact? 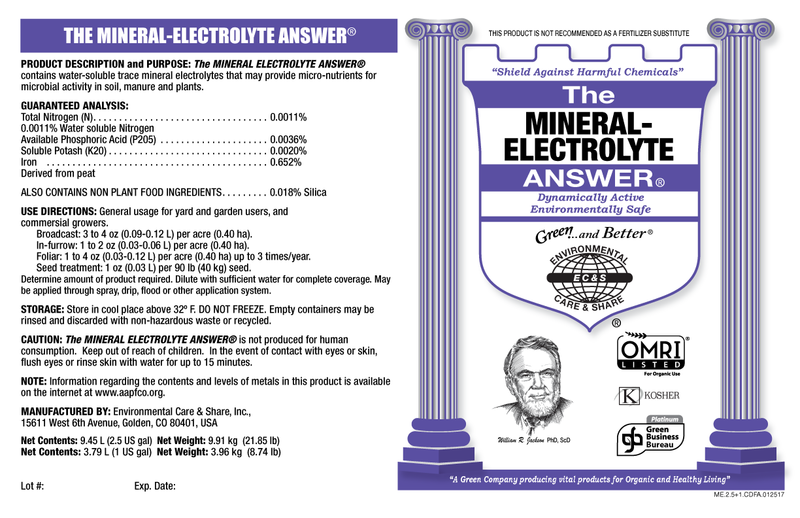 THE MINERAL–ELECTROLYTE ANSWER® contains organic electrolytes (fulvic acid), essential micronutrients, trace minerals, chelated minerals and nutrients in bioavailable form, serves as an outside electrical force. THE MINERAL– ELECTROLYTE ANSWER® stimulates microbial activity in soil. It can mimic functions of some plant growth regulators when applied properly, chelates minerals and other soil nutrients, enhancing their availability for plants. It reduces compaction and increases oxygen in soil by improving soil tilth. THE MINERAL– ELECTROLYTE ANSWER® helps water penetrate and permeate plant cells, assisting nutrient uptake and water storage during drought conditions, as well as balance water and assisting plant transpiration, the transport of water and nutrients of the cell tissues. Determine amount of product required. Dilute with sufficient water for complete coverage. May be applied through spray, drip, flood or other application system.